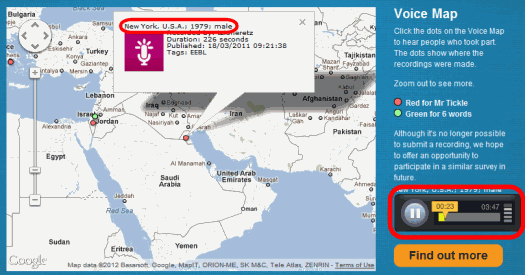 GALESL.weebly.com - Q & A: Help with International Accents, Page 6: Using Map Your Voice - G. A. L. E. S. L.
Let's say I want to get practice listening to an Iranian accent. 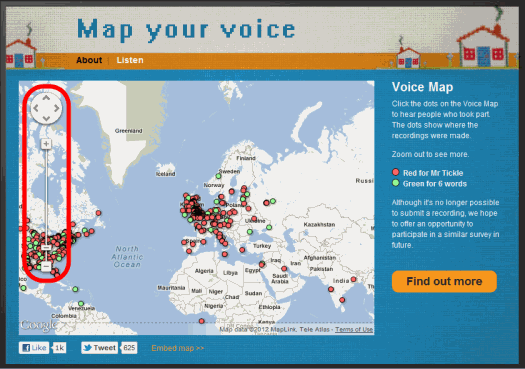 First I go to the Map Your Voice home page, part of the Evolving English project of the British Library. I click on "Listen to the voices" near the bottom. The page with the map appears. 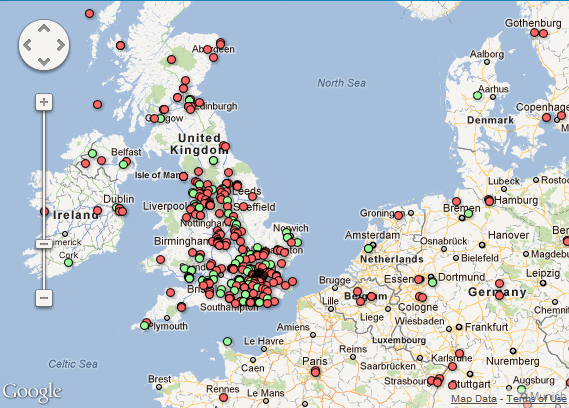 Each green dot represents a recording someone saying just 6 words that are a short example of their accent ("controversy, garage, neither, scone, schedule, attitude"). Each red dot represents a recording of someone reading the children's story "Mr Tickle". You can move the map around by clicking and dragging on it, or use the controls at the left of the map. There is also a control for the size/zoom of the map. 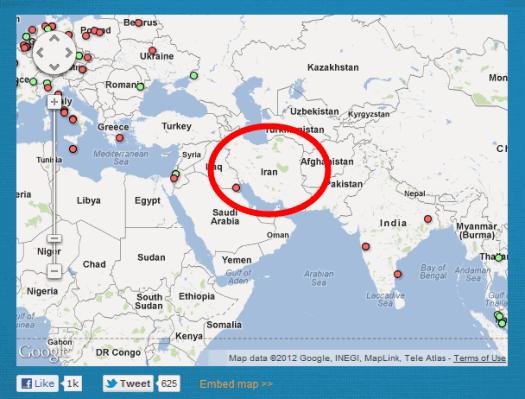 I click and drag the map to focus on Iran. There are no dots there! No recordings from people in Iran. I decide to try some other recordings from nearby countries, even though they will be very different. Near the bottom right of the page is a media player. I press the play button and hear the recording of the speaker reading the story of Mr Tickle. I decide to try another recording, to hear someone local to their location on the map. 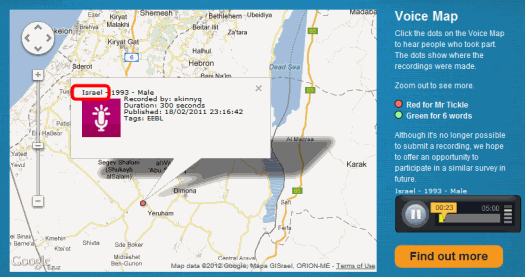 I see some dots in Israel and I click and drag the map to focus there. The dots are very close together, so I zoom in to see better. 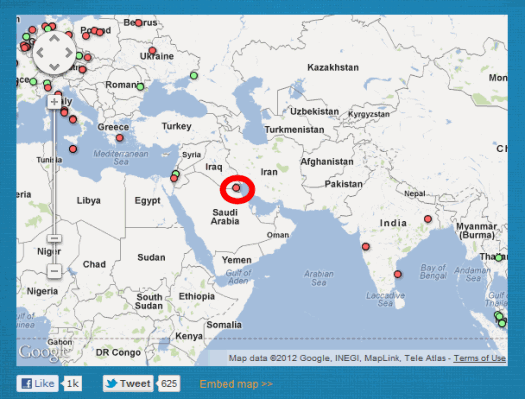 I click on the green dot in Jerusalem. This speaker isn't a local either! He's from London! Anyways, I press the Play button and hear him say 6 words in a southern English accent. I decide to try again, to find a local. I click on the red dot in the south of Israel. 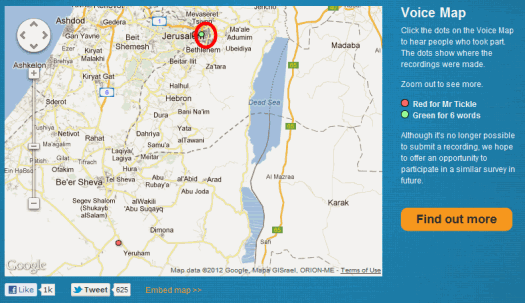 The box in the map shows the speaker is from Israel. Finally, someone from the country they are in! I press play on the media player and here a recording of the speaker reading Mr Tickle. 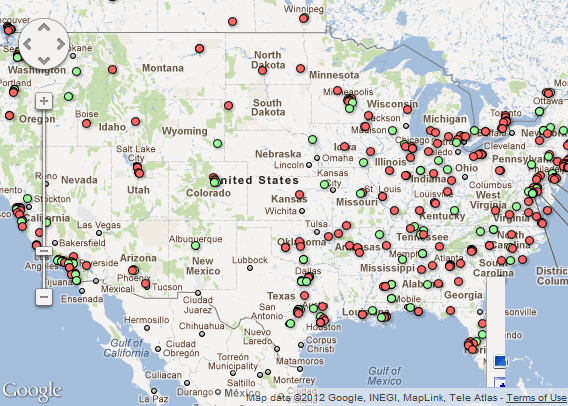 Map Your Voice has maybe hundreds of recordings from all over the world. If you want to hear native speakers of English, you can find many, many recordings from the UK and the US, and also some from Australia, Canada and New Zealand etc, and hear the great variety in the accents of native English speakers. You can get a very quick idea of the accent using the "6 words" (green dot) option or a good long passage to really grasp the accent with the "Mr Tickle" (red dot) option. The project is now closed. There will be no more recordings. There will never be a recording from Iran or anywhere else not already represented. 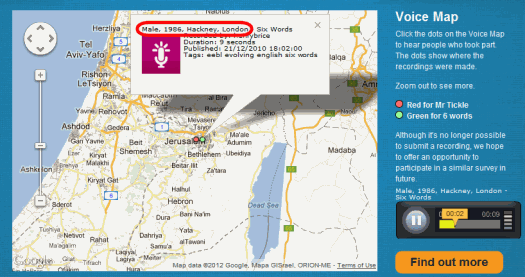 The accent may not be local; the location on the map is just where the speaker is located when they made the recording, so when I clicked on Israel, I heard someone from London with a London accent. There's no way to search for a specific accent. There's no way to link to a specific accent. There's no way to bookmark a specific accent. The sound quality is not always good; the recordings were made by ordinary people in their homes, not by experienced researchers with proper equipment. 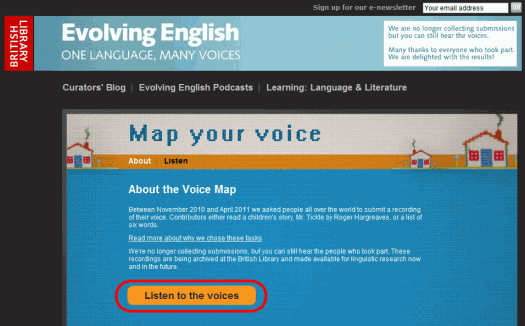 Overall, Map Your Voice is great for hearing lots of native English speakers' accents but not so good for finding a specific accent of non-native English speakers. In the next part (coming soon), I'll discuss using media like radio, TV, movies etc.